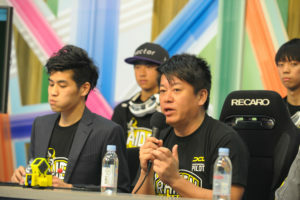 A press conference of RAIDEN RACING was held on April 25, 2018. 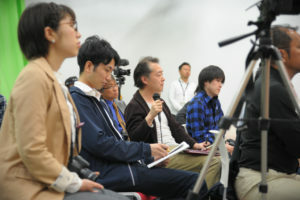 Many reporters came to the press conference. 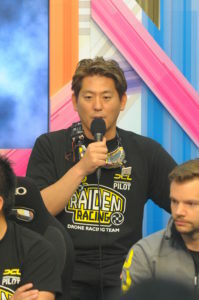 On Wednesday, April 25, 2018, a press conference on RAIDEN RACING by DRONE SPORTS Co., Ltd. was held at a special studio of J SPORTS sports specialty channel. Inauguration of Japan ‘s first professional drone race team “RAIDEN RACING” (hereinafter RAIDEN) and announced participation in Drone League “Drone Champions League” (DCL) of Europe’ s highest peak. 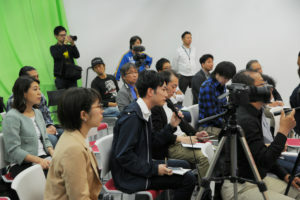 A lot of media gathered at the press conference, which highlighted the high degree of attention. 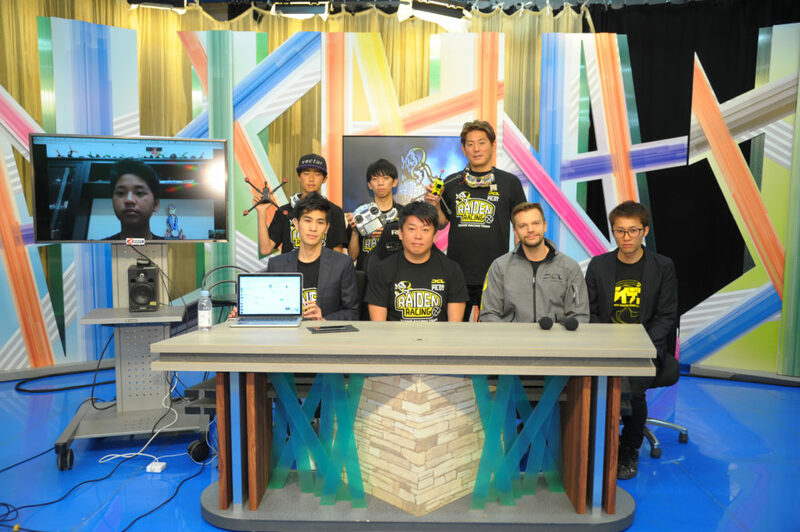 Businessman and co-founder Mr. Takafumi Horie, Mr. Anton Nelson of DCL director general director of video, Mr. Ryuta Kotera of interpreter, RAIDEN DRONE RACER (in order from the top right) “DK”, “KAZUMA”, “TAKUMI” , Relayed from Indonesia “MARIO”. 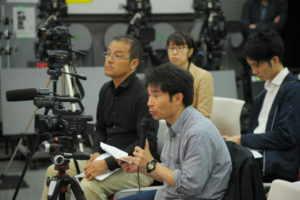 MC is Mr. Tetsuji Nishiwaki of DRONE Evangelist (Right Chair). In Japan, the recognition of the drone race is still low, in the world the drone racing is said to be a new sky sports but in JapanIt does not exceed the range of hobbies. We join DCL. DCL is a world drone league like to F1. It will be held in symbolic places of various countries such as the Great Wall of China. It is also fun visually. 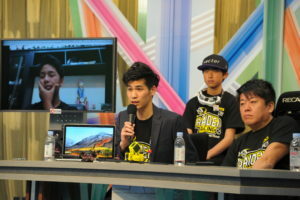 I make Horie Takafumi Innovation University(HIU hereafter) online salon opened . has started to hold a drone race tournament centered on HIU three years ago. As we repeated it twice and three times, that the Japan Drone Racing Association(JDRA) was formed . I feel the drone race is getting exciting. Of course, it is exciting all over the world, but from the perspective of engaging from the beginning, there is no doubt that the drone racing will greatly develop. It is interesting not only to see the drone race, also for investment targets.I know everything about the techniques used in drone racing. I think that my role is sponsored team sponsorship and team public relations. DCL welcomes the participation of the Japanese team very much. DCL wants to expand its market in Asia, and in August it will hold the first competition in Asia in China. In fact, we are currently discussing the 2019 season in Japan. First of all, I would like RAIDEN to have good performances in the 2018 season . Recognition of drone racing in Japan is still to come. Through the media, I would like you to know it. I would be happy if more people would want to try. I would like to overcome various challenges with the team. I would like to try hard to aim for the best in the world in order to participate in overseas races. I have been working on a drone race for about a year now, but I would like to wear skills that I can pass through the world through RAIDEN activities. I will practice more and aim for that level. Thank you for taking the opportunity to participate in DCL. This should be a very good opportunity for me. I am sorry that I could not participate directly in a press conference, but I would like to do my best to do the best in the game and try to keep results. ――How do you think about monetization of the professional team? （Yu Kotera）We have an advertisement space on uniforms.This is the same as football team etc. We also want to increase the content and increase the profits. ――Are you paying for drone racers? 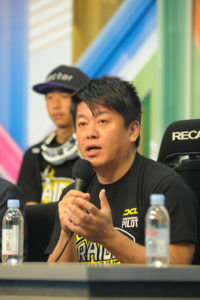 （Yu Kotera）I signed a contract with each pilot and I pay a fee.We will also bear the cost of accommodation and transportation to participate in the DCL, as well as the cost of the drone’s used during the racing (one 50,000 yen will be charged).Drone is made up of many parts, but by sharing them in the team, we can also repair each other. Such a system is something that can not be done in individual racing. ――Does the DCL race have an upper limit for Japanese racers? (Yu Kotera)Since it is closed this year, it is participating only in RAIDEN at Japan team.From next year, other Japanese teams may participate in the due to rule changes etc. 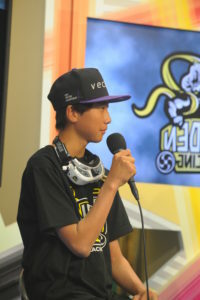 I would like other Japanese teams to come out. I hope to be able to create a variety of teams and be able to work hard. As for the team members’ formation, it is conditional to select four pilots. Three of them are Japanese and one is a foreign player as an observer. In addition to this, there are two pilot seates that participate when the main pilot can not participate. ――What are the differences between Japanese and foreign drone regulations? (Yu Kotera)In Japan there are regulations that only three can be blown at the same time. There are no such restrictions abroad, and 8 DCLs jump at the same time. As long as regulations in Japan are not revised, we are currently discussing with DCL, to hold DCL in Japan 2019, but it is difficult with the current law. We will coordinate with each place while understanding. 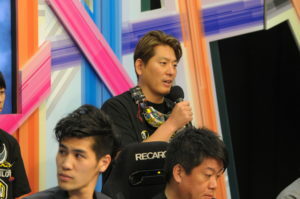 (DK)The DCL regulation is different from the drones race being held in Japan. Firstly, the drone is big. Radio waves are also different. In Japan, we are flying a radio wave from the controller to the dorne and steering, so if the airplane hides behind objects it will crash. With DCL, many antennas are set up, so it is possible to fly even where the field of vision does not reach. ――Do you participate in events other than DCL, or are you hosting them? ――How can we make the domestic drone racing excitement? The important thing in organizing the event is entertainment. I have some idea that will make fun. (Takafumi Horie)Integral excitement including the race venue is important. Even children can be professional pilots, so I have a very dream. I think that it is necessary to acquire fans more widely by performing comprehensive coordination such as experiential society, VR, gourmet. (AntonNelson)From the standpoint of video production, I think that it is important to increase fans by providing high quality media contents. Actually, I have also taken at the school of a middle school pilot of RAIDEN, but I would like to make attractive contents by presenting the process by which a hero of a drone race is born from such a picture. ◆ DCL 2018 season, opening race is June 22, 23 Germany / Munich! Please look forward to the success of RAIDEN! Finally, we will inform you various news through its inauguration, RAIDEN which started full-fledged activities, and activities. While casting a single stone on the way the Japanese drones industry is, we will propose new sports and will provide you with new entertainment. Also, we hope that you will be able to inform us if companies, individuals, who are interested in the sponsor of RAIDEN who will challenge the world. In English VER, the inquiry form may not work well. Please go to info@raidenracing.com. We will repair. This article is good! If you think, please share it!